-Due to the lack of televised games, college and high school baseball players are far less familiar to the sporting public than players eligible to be drafted in the NBA and the NFL. -Although the same is true of all drafts, all too often a player who goes in the first-round of the MLB draft is never seen or heard from again. -Due to the minor league system in baseball, draftees almost never have any sort of immediate impact, thus limiting the number of Rays fans running out to by Tim Beckham jerseys today. Despite those glaring facts and the fact that the media seems to have no real interest in the draft, I certainly do and I know many other baseball fans do as well. As such, I’ve been scouting the crop of talent available in this year’s draft a lot in recent weeks and I’ve gone through and made a list of the top three players I’m hoping my boys–the Minnesota Twins–can snag with their first pick in the draft (number 14). As we’ve seen in recent years the younger brothers of former first-rounders (Justin Upton and Stephen Drew) have done pretty good for themselves at the professional level. As such, I’d like to see the Twins take a stab at Rickie Weeks’ younger brother Jemile. Even though he plays the same position as his older brother, Jemile is not the same kind of player. The younger Weeks is a switch-hitter who doesn’t have, and likely will never have, the kind of power Rickie does. Weeks is a line-drive, slashing type of hitter who squares the ball up well and can really get things going with leadoff-type skills. He runs extremely well and could steal a ton of bases in the pros. His defense is somewhat in question, but could definitely be improved by coaching at a higher level. 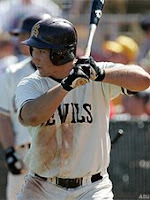 (2) Brett Lawrie, C/3B, Brookswood SS, Langley, B.C. Lawrie brings two very important things to the table for the Twins. First he has the ability to play third-base, obviously the biggest hole in the Twins lineup since Corey Koskie departed via free-agency. He also has the ability to contribute behind the dish, a move that would allow the Twins to rest Joe Mauer’s knees more often and/or eventually move him to a different position. Due to the fact that scouting Canadian players can sometimes be difficult because of the lack of opportunity to see them the information on Lawrie is a little limited, but scouts know all about Lawrie and his plus power potential. At present he’s mostly a pull hitter without a true position, though he’s shown the tools — raw though they may be — to handle being a catcher and playing the hot corner. It may take a while, but putting that bat behind the plate could one day make him a premium player. Wallace, from all reports I’ve read, is one of the best hitters in college and perhaps in the entire Draft class. He possesses unbelievable plate discipline and has the ability to hit .300 with 25+ homers in the majors on a yearly basis. What limits Wallace–and is driving him down on many people’s draft projections–is his body. At 6’1″ 245lbs he is a pretty big boy. Odds are this will limit his ability to play 3B at the Major League level and will be relegated to first base detail, which makes Justin Morneau an immediate roadblock. The Twins could groom Wallace as a 1B/DH, but would be more inclined to draft him and put him on a training regimen that would allow him to play third base in the pros, thus immediately increasing his value.